With over 20 years experience specialising in hot dip galvanizing, shot blasting & the application of protective coatings, Shannonside Galvanizing is one of Ireland's leading Galvanizing plants located in Drombana, Co. Limerick. We are an energetic and creative team, dedicated to high standards of performance and excellence. All who work within the company have been entrusted with an opportunity to improve the quality of life of our customers, our fellow employees, and the community that surrounds us. 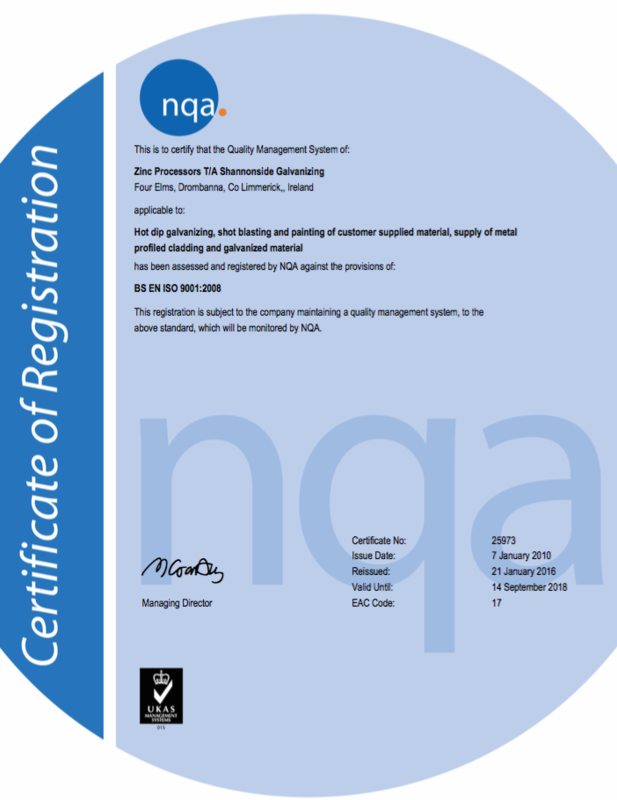 Two of our key members are the only ICORR Certified Hot Dip Galvanizing Inspectors in Ireland. It is the policy of the company to provide services that fully and consistently meet the needs of our customers, delivered through operations which ensure the health and safety of the workforce and public without damage to the environment. The Company values its employees and its success as a company has been built on a spirit of innovation, expertise, and commitment of its employees. It is their motivation and commitment to doing a first rate job that makes us stand out from the competition. We actively recruit and work hard to retain the best employees for the future. With our vast experience in the areas specified below and our ISO accreditation, Shannonside Galvanizing’s understanding of the requirements for cost effective solutions for all your surface preparation and coating requirements is unparalleled.